No matter how many interviews you go on, it can be difficult to get comfortable enough to relax, especially if it's a job or a school that you really want. However, it's helpful to remember that interviews aren't just an opportunity for your interviewer to assess you, they're also an opportunity for you to examine your interviewer, the company or the school. You get to decide whether or not that place is the right fit for you. Generally, if you're being called in for an interview it's because the institution or organization has already decided from the record that you have, on paper, the qualities that they are looking for. An interview is set up so that both you and the organization can learn about one another's personal qualities and culture respectively. An interview, in short, is an opportunity to see if things feel like a good fit for both of you and for the organization. The more you see it is a chance for you to make a decision for yourself, the less you'll feel nervous. 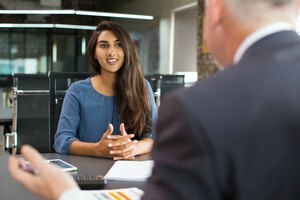 Why Is It Important to Ask Questions in an Interview? You may wonder, "How many questions should you ask an interviewer?" Many people who are going into an interview, whether it's for a job or for acceptance into a club, institution or organization, feel that it is their time to be assessed. This is true. Ultimately, the power to grant acceptance or admission lies with the interviewer. However, most interviewers only want to bring on applicants who are knowledgeable not just about the position but about the company or organization itself. They want to bring someone on who they feel is perceptive, intelligent, thoughtful, interested and above all, someone who understands their organization. By taking the opportunity to ask questions in an interview, you are showing the interviewer that you're engaged in the process and that you want to know as much as you possibly can about the position before an offer is made. This lets them know that you really do care about what your future looks like and that you are serious about the position. It can be easy to get intimidated in an interview and focus solely on your behavior or the reactions and attitudes of the interviewer. It's also normal to fixate on the questions for the interviewer to ask. This can lead to a situation where you're attempting to read the body language or behavior of the person interviewing you and not really answering honestly. This is called people pleasing. Most people do want to please and in an interview, you want to feel as though you met the individual's approval. But the fact is that by being less than honest, you're doing a disservice both to the interviewer and to yourself. Giving answers that you know the interviewer will want to hear versus answers that you know to be true might mean that you get hired at a job that isn't genuinely the right fit for you. If this happens, it can create a negative situation for all parties. It's important to ask questions that you honestly have. If you ask your interviewer what time employees generally leave the office because you want to know what kind of commitment is expected, your interviewer might read that as a sign that you're not committed to staying late and hire someone else. That's actually a good thing because it means you didn't just get sucked into a job that you don't really want. In this way, asking honest answers gives the outcome that is best for both parties. How Many Questions Should You Ask An Interviewer? It can be difficult to know an exact number of questions that interviewees should have prepared to ask an interviewer. It's something that should be taken on a case by case basis, but it's always a good idea to go in with at least a few questions. This shows the interviewer that you're not only prepared to do the work or to be a part of the institution, but you have given the matter consideration and want to know more about the company. Some interviews are set up as a battery of questions for an interviewee to answer before offering the you the opportunity to ask questions. In this case, you may find that during the interview you come up with some questions that you'd like to ask. 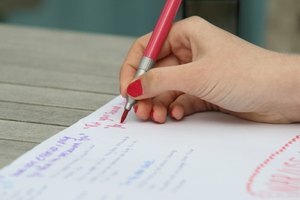 By having a pen and paper out to jot down questions as you're being interviewed, you'll be better able to keep track of any new questions that come up. Other interviews are organized more like a conversation. In this scenario, the interviewer may ask you questions that lead to a discussion and that give you the opportunity to ask either any questions you've had prepared for a while or questions you come up with during the course of the conversation. Either way, you should try to be prepared with at least five questions to ask before your interview. These may change during the course of the interview, or you may find that your interviewer answers these questions during the conversation. If that happens, abandon the questions. It's a bad idea to ask a question that has previously been answered because it makes it look as though you haven't been paying attention to what was said. If all of your questions have been answered during the interview, you can say something like, "You've answered all the questions I prepared in advance, and I don't think I have any others right now." Being honest is far better than asking a redundant question simply to get "credit" for having prepared questions before you arrived. You may ask, "What should I research before an interview?" It's hard to know ahead of time what questions are asked in an interview. The best way to prepare for your interview is to do as much research as possible on the organization or institution that you're hoping to join. Read up on its history, its founders, its past and any news stories you can find about it. If there have been major changes to the leadership of the organization make sure you have that information and that you're prepared to discuss it in a thoughtful, intelligent way. What is the organization known for? What are its major strengths? Does it have any weaknesses that you know about? Does it have any areas where it has fallen short? These shortcomings are particularly advantageous to an interviewer who is seeking a position in an area that is directly affected by them. If you have the opportunity to point out where problems lie and indicate how you might be able to correct them, that is an excellent thing to bring up in an interview. Additionally, research the position that you're hoping to get. See if you fully understand exactly what is expected of you, see if you understand the chain of command and who you report to, and be sure that you know exactly what the deliverables are for the individual in the position you are interviewing for. What will you be expected to produce? What kind of support will you have? What kind of teaching or assistance is available for the processes you might not be familiar with? Above all, the best way to prepare for the interview is to get as much information as you possibly can on exactly what is desired in your position. Also, figure out ways that you can help the organization or the company succeed with your unique set of skills and abilities. What Questions Are Asked in an Interview? What were some challenges you faced and overcame in your last position? What was the primary strength that you brought to your last position? What was your favorite and least favorite part of your last position? These questions are designed to get an understanding of the kind of work you did before and get an understanding of what about this work you liked or disliked. This may help the interviewer better understand you in terms of how you would perform in this position. What do you hope to gain out of this position? Why do you want to join this specific organization? How long do you expect to be in this position? What is your most important long-term goal? How Should You Prepare for Your Interview? A good way to prepare for your interview is to make sure that you understand exactly what you're interviewing to do, and then plumbing your mind and your experience for reasons and evidence that you truly are the correct fit for this position. This means asking yourself to reflect honestly on why you want this job or to gain admission to this institution. If the only reasons are superficial ones, such as money, cache or status, your interviewer will likely be able to see that a mile away and tell quickly that you're interested in this for material gain. However if you have a genuine interest in the organization, and a desire to be a part of it for reasons deeper and more significant than the salary or the status associated with the name, write down the reasons why. Companies, universities and organizations give dozens of interviews to a wide range of applicants. What they are looking for is someone who belongs there. Someone who understands the culture and what the goals of the organization are. They are looking also for someone they can expect will want to grow with the company and stay there for a long time. If they can tell that you are an individual who is interested in being that kind of part of their institution, your chances of being selected increase significantly. 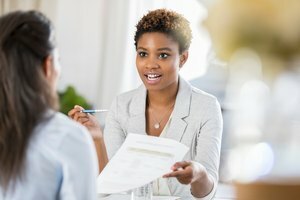 What qualities do you look for when you're interviewing someone for this position? What kind of individual succeeds and thrives at this organization? What would you want a person in my position to know about this organization that might not be obvious? Is this an opportunity for growth? Friedman, Ashley. "About Questions For Your Interviewer." Synonym, https://classroom.synonym.com/about-questions-for-your-interviewer-13714926.html. 28 September 2018.